Team, we've hit our first target of 18K! And not only have we reached it, but together we reached it only 11 days into the campaign, with 11 days still to go! With such overwhelming support behind us, we're setting our sights on our stretch goal. We've realised that the kind of launchpad we want to create is not one that's bigger, it's one that's better. So for our stretch goal of $30,000 we're putting our money where our mouth is and valuing quality over quantity. Help us create the business class version of our launchpad, Upstart. Scroll down for more details. Vivien has always loved food. Like, seriously. By day she delighted in everything from the arrival of mango season to the smell outside a bakery. By night she would nerd out reading food politics papers late into the evening, crushing croissant crumbs into the desk, contemplating the challenges we face around food and how we might pull ourselves out of this spot. The problem was, she felt powerless. The more she learnt, the bigger the food problems felt. She wanted to understand how issues like obesity, climate change and the aging farming population were affecting her community. And what could she, a mere student in the burbs, even hope to do about it? About 18 months ago, Vivien found YFM and her story started to change. She met a small cluster of other out-and-proud food nerds and found that she was not alone. The cluster thought Viv was amazing. Viv thought the cluster was amazing. And so it began to grow. Together, they started to organise. They hosted workshops to bring young people together and teach each other how to cook. They worked on farms to see and hear new perspectives on food. They spoke up at events to share their ideas. Through mentoring, they learnt leadership skills to empower others to take action too. They also dressed up like carrots, because they were millenials and that’s what happens. And they soon realised that they did have power, it was just about realising it was there. YFM didn't make Viv awesome, she already was. YFM helped her make her awesome come alive. It helped her translate it into real, tangible change for the thing she cared about: food. You might not have met Vivien before, but you also kind of have. Because we’re all a bit Vivien . Imagine if we were able to empower more Viviens (like, a heap of Viviens) to power the next generation of food change makers in Australia? Imagine what Australia would look like in 20 years time if we helped hundreds of Viviens to get the leg up they needed? To do just that, the Youth Food Movement is creating a launchpad for 100 young food leaders around Australia. The launchpad is a 9-month training program to build the collective capacity of young people to be active change makers in the world of food and agriculture. A Volunteer Mentoring and Self-Development Program - including regular one-on-one leadership mentoring for team leaders, self-development and goal-setting workshops and involvement in design and delivery of three food education projects in their local community. An Online Training + Capacity Building Program - featuring online training webinars delivered by special guest speakers in food and agriculture and senior YFM staff. Participants will be upskilled in project design and management, communications, marketing and behaviour change and learn about the intricacies of the Australian and global food system from industry professionals. 1 x Annual National Team Retreat + 6 x Annual Chapter Retreats - for delivery of face-to-face volunteer training, personal and team reflection, field trips, strategy and community building and to celebrate the invaluable hard work of YFM volunteers across the country each year. Be inviting all of our favourite food crushes to be a part of the program, meaning more experienced trainers and access to important thinkers and doers in food and agriculture. Create a more personalised mentoring program with our team leaders and support all participants secure mentors in their areas of interest. Provide participants access to the YFM Handbook and Toolkit meaning young leaders have access to the resources and networks they need to start their food journeys. Why young people, you say? Over the past 5 years at YFM, we’ve seen ever more young people clamoring for a chance to have their voices heard, to be a part of the thriving Australian food movement, to change the shape of how we grow and eat food. We know, because they get in touch with us each and every week. Reaching our tipping point goal of $18,000 will allow us to support YFM team members to research, design and implement a 9-month online training program for participants across the country, engage specialist guest speakers for online workshops, cover travel and accommodation costs associated with getting volunteers to chapter training retreats and operational costs associated with providing ongoing mentoring and support to volunteer team leaders. But first we need your help. Pledge to YFM’s crowdfunding campaign to help us make this dream become a reality. And with enough support, we’ll see you next year at Upstart! A big thank you to our promotional supporters! YFM exists to grow food education and leadership in Australia. Help us create a launchpad program for 100 young leaders and grow the next generation of change makers in food and agriculture. You’re helping us change the future of food. To say thankyou, we’ll send you a special recipe e-card that will turn delicious leftovers and wasted ingredients into a delicious meal that makes a difference. We know you love talking about food, so why not kickstart the conversation with a unbleached natural cotton tote, printed with a catchy food quote. You’ll be able to wear your veggies proudly with a special set of TaterTat temporary vegetable tattoos. Includes free postage. Have you ever thought about launching your food business? Do you want to share your passion for food with the local community? Have you been stockpiling important questions you want to ask farmers and industry experts? We’re bringing together a team of incredible food experts for a webinar series on all things Australian food and agriculture. Hear from Gourmet Traveller's Chief Food Critic and Deputy Editor Pat Nourse on How to Build a Career in the Food Industry. We'll be in discussion with the team at Sydney's Cornersmith on the Challenges and Triumphs of Seasonal Eating (and how to build communities around food). And we'll be announcing more special guests in the days to come, stay tuned. Bring your questions, get advice, and turn your ideas into action. Get your daily caffeine fix sustainably, with a colourful cup for your coffee or tea. Made from glass, it’s easy to clean and helps you take care of our environment. We can’t wait to have you join us for an exclusive webinar too (for details, see above! ).You’ll be able to choose one option from the series of webinars - just check you have an up-to-date device and a strong internet connection to participate. Meet and mingle with food-focused people just like you! We’d love to see you and a guest at our next events in Sydney, Melbourne or Brisbane where you can eat, learn, and talk the trailblazers that are changing the tomorrow’s future, today. OPTIONS INCLUDE: 2 x VIP tickets to the next YFM Melbourne event - Food Forage + Feast, late November 2016 -OR- 2 x VIP tickets to the next YFM Brisbane event - Farm to Plate Tour + Meal, 26th Nov. 2016 -OR- 2 x VIP tickets to the next YFM Sydney event - Waste Not food waste social enterprise Launch Night, Jan/Feb. Price includes GST. Est. Delivery Date: *Australia Only* As indicated above. This YFM Food Fighting Kit features a special edition ‘Give Food Waste the Flip’ tote bag, Love Food Hate Waste apron + teatowel, tupperware container + set of YFM WasteNot Dips. You’re passionate about reducing waste, and you want to shout it from the rooftops. The Food Fighting Kit will help you get creative while you’re cooking up flavoursome meals and conserving the planet. What’s more, you’ll be one of the very first people to taste our YFM WasteNot Dips before they hit the market next year - there are three unique flavours you’ll love. Access to all 3 webinars, a reusable coffee cup keepcup + YFM limited edition totebag. You’ve taken ‘dedicated’ to the next level. You’re a super foodie who is ready to find out everything you can from industry experts. You’ll be able to take full advantage of all three webinars with Australia’s top food experts, and we can’t wait to see where this new knowledge takes you. Note: You’ll need an up-to-date device and a strong internet connection to participate. Price includes GST. We’’ll bake you a cake branded with your name, and sing your praises on social media to our wide community of over 17K followers! Tell us your vision, and we’ll make you a personalised cake to suit your needs. To acknowledge your contribution, we’ll feature your logo on the crowdfunding page, and you’ll be distinguished from others as a financial supporter of the campaign. Price includes GST. 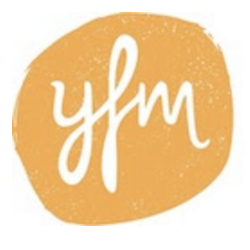 Have you wondered what makes YFM and millennials tick? Do you want to learn how to mobilise and engage a youth community? This is a special opportunity for you to meet with founding YFM’s founding Directors Alexandra Iljadica and Joanna Baker over lunch, and have your questions answered. These two talented women will give you amazing insights that you’ll be able to apply to your business. To acknowledge your contribution, we’ll feature your logo on the crowdfunding page, and you’ll be distinguished from others as a financial supporter of the campaign. Price includes GST. Available in Sydney. Get your team working together with an office team session for up to 20 people. We’ll come to you, and get your staff working together to build an amazing set of food skills directly applicable in your office kitchen space. We’ll run an KITCHEN HACK to show your team how to transform leftovers into quick healthy, delicious lunch meals. We’ll share a photo of your day on our engaged community of over 17K fans on Facebook, Twitter, and Instagram, and tag your business. To acknowledge your contribution, we’ll feature your logo on the crowdfunding page, and you’ll be distinguished from others as a financial supporter of the campaign. Available only in Sydney. Price includes GST. Got a business challenge? We’ll help you solve it. Whether you’re looking to recruit millenials, create cut-through social content, or develop a killer community engagement strategy, we’ll have you covered. We’ll deliver an outcomes-focused hackathon that will help you improve your business strategy. We’ll share a photo of your day on our engaged community of over 17K fans on Facebook, Twitter, and Instagram, and tag your business. To acknowledge your contribution, we’ll feature your logo on the crowdfunding page, and you’ll be distinguished from others as a financial supporter of the campaign. Price includes GST. Back our next national retreat, and we’ll co-design and facilitate one day of your next off-site session. We’ll deliver activities based on your needs, whether you’re looking to run workshops, team building activities, or develop community engagement strategies. We’ll acknowledge your business’ role in training the next generation of food leaders through a dedicated EDM that announces you as our biggest backer yet! We’ll feature your logo on the crowdfunding page, and announce your incredible contribution to our community of over 17K fans on Facebook, Twitter, and Instagram. Price includes GST. * $6,500 in offline donations included in total.